After Elvis and Isaac Hayes, the third Memphis Music Icon has passed away. Riley B. King, the legendary guitarist known as B.B. King, whose velvety voice and staccato-picking style brought blues from the margins to the mainstream, died Thursday night. He was 89. His daughter, Patty King, said he died in Las Vegas, where he announced two weeks ago that he was in home hospice care after suffering from dehydration. Even with a long list of honors to his name -- Grammy Lifetime Achievement Award, Rock and Roll Hall of Fame induction, Presidential Medal of Freedom -- he maintained a relentless touring schedule well into his 80s. Throughout his career, King evolved with the times to incorporate contemporary trends and influences without straying from his Delta blues roots. Whether he was sharing the stage with U2 on "When Loves Comes to Town" -- a scene memorialized in the 1988 concert film, "Rattle and Hum" -- or playing in the East Room of the White House with Buddy Guy, Mick Jagger, Jeff Beck and others, King's single-string guitar notes trilled with an unmistakable vibrato from his hollow-bodied Gibson affectionately known as Lucille. Over the years, he racked up 30 Grammy nominations and 15 wins, including two in 2000: one along with Eric Clapton for Best Traditional Blues Album for "Riding with the King," and another with Dr. John for Best Pop Collaboration with Vocals for "Is You Is, or Is You Ain't (My Baby)." wildfishie: thanks for the nice and interesting quote. That's what I was missing in the article. Just a photo does not mean much to me. As I don't like his music I never read anything about him. 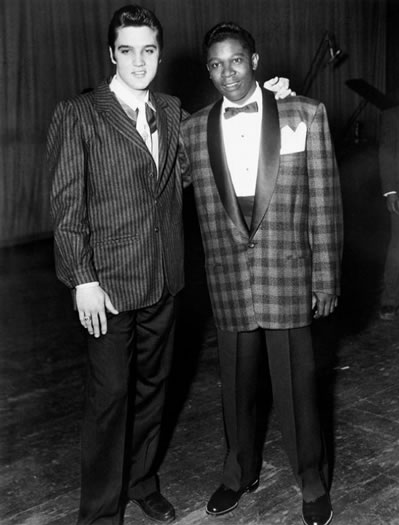 "When I first met Elvis, I didn't think too much of Elvis Presley. I thought he was a handsome young man, but he wasn't singing as he started to sing later. So I didn't think too much about him - his guitar or his singing - at the time. But I thought he was a nice person - it wasn't that I disliked him. Finally I heard him do some Arthur Big Boy Crudup. I heard him do some of those songs, and then I started to turn my head a little bit. That ain't the same Elvis Presley that I been hearing. And he went on from there doing some other things that sound black to me. That's when I started having respect, respect, respect. And he sorta earned it, earned that respect from me at that time. Finally I had a chance to meet him and I found out that he really was something else. He started to be more and more and more. And he was still like that to me, Elvis was, until he died. As far as I was concerned, he was growing all the time." Their connection is obvious: Memphis. Natha, are you quizzing us, or are you wondering about their connection? Okay. Apart from the photo, what is the connection?